Information transportation agencies need to identify alkali-silica reaction (ASR) in concrete structures and pavements can be found in the Federal Highway Administration's (FHWA) new Alkali-Silica Reactivity Field Identification Handbook (Pub. No. FHWA-HIF-12-022). "The guide provides a quick visual reference to assist users in detecting and distinguishing ASR in the field from other types of damage," said Gina Ahlstrom of FHWA. ASR occurs when silica in some aggregates and alkalis in concrete combine with water to form a gel-like substance. As the gel absorbs water and expands, it can cause the concrete to crack. Over time, the cracks enable other forms of distress to occur, such as freeze-thaw damage or corrosion. This can lead to premature deterioration and loss of service life for concrete pavements and structures. Another type of alkali-aggregate reaction is alkali-carbonate reaction (ACR), which involves certain types of dolomitic rocks. This reaction can also result in the expansion and cracking of concrete elements. As cases of ACR are more limited, however, the handbook concentrates on identifying ASR. The handbook graphically illustrates the sequence of how ASR occurs. Field symptoms of ASR are then described, including cracking, expansion, localized crushing of concrete, extrusion of joint material, surface pop-outs, and surface discoloration and gel, which may be alkali-silica gel or lime leaching from the cracked concrete. Photos provide a visual reference for identifying symptoms. Users of the handbook will find information and photos on the effect of exposure conditions, including moisture and temperature. Concrete that is exposed directly to moisture, for example, is likely to exhibit more severe symptoms of ASR than concrete that is less exposed. Also discussed is how ASR can occur simultaneously with other deterioration processes or may make the concrete more vulnerable to these processes after ASR damage has occurred. Examples include steel corrosion and freeze-thaw deterioration. The handbook highlights non-ASR-related distress and notes that all forms of deterioration should be considered when performing a condition survey. A brief overview is provided on managing pavements and structures affected by ASR. A confirmed diagnosis as to the presence and extent of ASR requires laboratory testing and petrographic examination of concrete cores. By combining the results of the laboratory investigation and the symptoms from the site investigation, agencies can determine the likely contribution of ASR to the observed damage. More information on managing affected structures is available in the 2010 FHWA Report on the Diagnosis, Prognosis, and Mitigation of Alkali-Silica Reaction in Transportation Structures (Pub. No. FHWA-HIF-09-004). The report is available at https://www.fhwa.dot.gov/pavement/concrete/pubs/hif09004/asr00.cfm. FHWA expects to release a new document, Alkali-Silica Reactivity Surveying and Tracking Guidelines, by fall 2012. The handbook's three appendices feature collections of photographs illustrating ASR in bridge structures, concrete pavements, and other transportation structures such as highway barriers, light poles, and curbs. To download a copy of the handbook, visit www.fhwa.dot.gov/pavement/concrete/asr/field.cfm. For current information on ASR, visit FHWA's online ASR Reference Center at www.fhwa.dot.gov/pavement/concrete/asr.cfm. Launched under FHWA's ASR Development and Deployment Program in 2009, the center contains more than 300 specifications, guidance documents, test methods, and other references on ASR. Updates on ASR can also be found in FHWA's free quarterly technical update, Reactive Solutions. The update is available at www.fhwa.dot.gov/pavement/concrete/reactive/index.cfm. To subscribe, send an email to asrnewsletter@transtec.us. For more information on the handbook or the ASR Development and Deployment Program, contact Gina Ahlstrom at FHWA, 202-366-4612 (email: gina.ahlstrom@dot.gov). FHWA's Office of Infrastructure Research and Development launched three ongoing ASR research projects in 2008. The first study, "Advancing the Fundamental Understanding of Alkali Silica Reaction Mechanism and Developing Reliable Accelerated Laboratory Test Method," has two objectives: 1) Developing prescriptive concrete mixture designs that are resistant to ASR and provide 75 years of service life with minimal maintenance, and 2) Developing an accurate and reliable accelerated laboratory test method that can be used in lieu of the ASTM C 1293 method, which can take 1–2 years. The second study aims to "Develop Nondestructive Field Test Methods to Quantify ASR and Also Develop Cost-Effective Rehabilitation Methods." This study will develop or modify suitable equipment to detect the presence of ASR in existing concrete infrastructure and predict the progression of ASR for the remaining service life of the structure. Methods are also being developed to rehabilitate concrete infrastructure affected by ASR so that it can achieve the designed service life. The third study, "Accelerated Determination of Alkali-Silica Reaction Susceptibility During Concrete Prism Testing Through Nonlinear Resonance Ultrasonic Spectroscopy," is developing a reliable rapid nondestructive technique for evaluating concrete mixtures for ASR that can be used instead of waiting up to 1–2 years for the ASTM C 1293 results. For more information on the ASR research studies, contact Paul Virmani at FHWA, 202-493-3052 (email: paul.virmani@dot.gov). 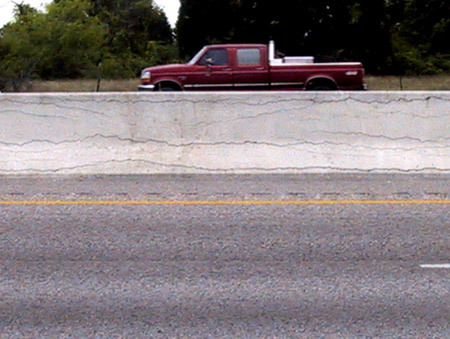 This concrete highway barrier is affected by alkali-silica reaction (ASR).